Olentangy’s Kayla Primm passes in front of Olentangy Liberty’s Gia Gaetano during the first half of Tuesday’s OCC showdown in Lewis Center. Sometimes it’s just best to take whatever avenue is available. 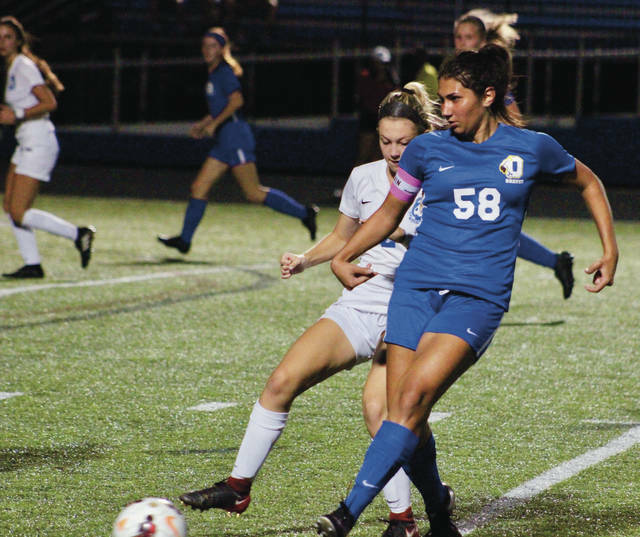 After a couple of near-goals set up by seemingly perfect feeds, junior Kayla Primm just took it herself and scored the only goal to keep the Olentangy girls soccer team right in the thick of the OCC-Buckeye race. Host Olentangy stayed in a first-place tie with Olentangy Orange thanks to a 1-0 win over Olentangy Liberty Tuesday night in Lewis Center. Primm wove through the defense on the left side, moving to the middle before scoring back to the lower left with 32:20 left in the game. The goal came a few minutes after Julia Francis sent a perfect pass from the left to the opposite post where Sydney Richards touched it just wide right, and Bailey Hall had a shot from the right side saved by Liberty goalkeeper Riley Cartwright. Liberty had a chance to tie it up with a minute and change left after Gia Gaetano was fouled just outside the box. Gaetano tapped the ensuing free kick to Quinn Casey on her left, giving the Olentangy defense time to converge and block the shot. Neither coach was exactly thrilled with the execution on that exchange. Olentangy almost extended the lead in the 60th minute when Jaime Rosales had a shot with a seemingly empty net. But, defender Elise Kochan got in front of the shot for the save to keep Liberty within striking distance. Liberty had its first scoring chance in the 13th minute, but Olentangy’s Raj Robinson stepped in front of a Nora Gilger shot from the top of the box. Gilger got a header on goal off a Jasmine Hauser free kick in the 19th minute, but Olentangy (10-3-2, 4-0) goalkeeper Katie Scott was there for the save. Scott finished with two saves. Olivia Johnston broke free and got a shot from the right that Cartwright went to her knees to stop at the horn to keep it scoreless at the break. Cartwright had nine saves for the Patriots (5-8-2, 2-3), who had a three-game winning streak snapped. “She was very good,” Carter said. Cartwright left the game in the 66th minute when she was hit in the head after going to the ground on a save. Savannah Blessing took over and made three saves in her first varsity action. Next up, Liberty plays a non-league contest with Bishop Watterson at Otterbein University Thursday at 8 p.m. Olentangy is off until Saturday at 3 p.m. when it closes league play at rival Olentangy Orange.